Have you ever dreamed of driving your own sled dog team? 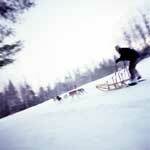 Enjoy this wonderful adventure at Eden Dog Sledding. We will match you with your own dog team, and guide you through our beautiful network of private trails. Experience the thrill of gliding across freshly-groomed trails behind Alaskan sled dogs. This is an amazing activity on your own or with a group. We require that guests learning the sport take at least two lessons. The first lesson will educate you on all of the functioning parts of the team; you will ride in the sled and get a sense of the trails' terrain, the speed of the dogs and the feel of the sled. During that lesson you will have opportunities to ride the runners. On the second lesson we will give you your own team to drive with the background you gained in your first day's experience. You will drive either a 3-4 dog team behind the guide's lead sled, or a larger team with your guide riding as your passenger. No guests are allowed to ride in sleds driven by our students; those passengers can ride in the guide's lead sled. The two lesson series may be done on consecutive days, or on a single day with a mid-day break for lunch. Dog sledding is an incredible winter adventure. Take advantage of Vermont's premiere dog sledding facility at Eden Mountain Lodge. Drive your very own team of racing dogs and imagine yourself as a national sprint racer, or a hardy Iditarod competitor. Call 802-635-9070 or email for more information. There is a maximum weight limit of 350 lbs of passenger weight per sled. Above this weight a second team and sled must be used to accommodate the group. We have one sled that can accommodate up to 400 lbs which is available when schedule and conditions allow for an additional charge of $50.